Fishing in our area is beginning to move into a normal summer routine. Runoff has started to peak on our rivers and the flows are starting to come down. The Snake River is still off color in the majority of sections but there are a few clear stretches that are starting to fish very well. 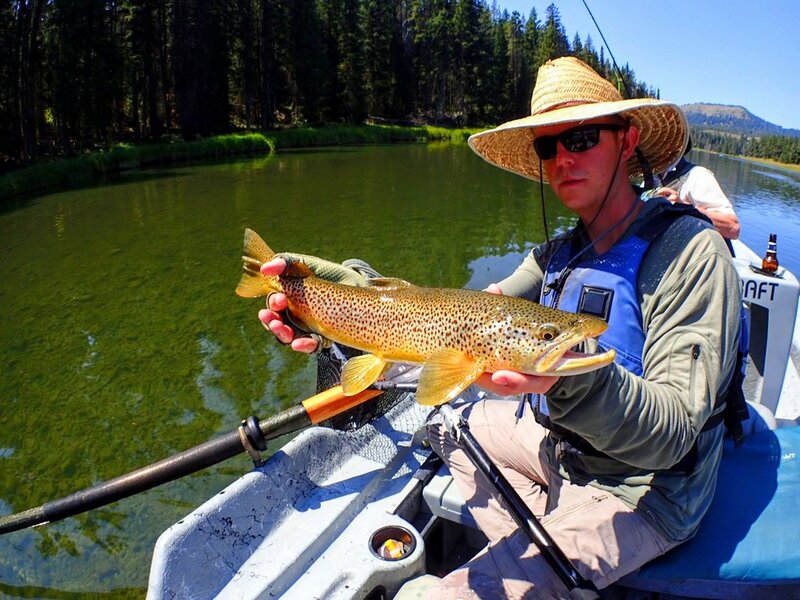 The Salt River should just about be clear, the South Fork River is clear and dropping, Lewis Lake is fishing very well, and the Green River is clear and fishable. There is still very good nymph and streamer fishing to be had, but the dry fly fishing really just started to pick up. Dry fly fishing is certainly my favorite but I would never hesitate to throw streamers on occasion. I saw possibly the biggest brown trout I've ever seen follow, and try to eat, a hooked fish that was on my client's line last week. We landed the smaller hooked fish and measured it at 19 inches so that brown trout was big enough to try and eat a 19 inch fish. That being said, it's hard to pass up some of the quality dry fly fishing we're having right now. We're getting hatches of PMDs, caddis, yellow sallies, big stoneflies, and some gray drakes depending on where you're fishing. The trout are starting to look to the surface and many of them are starting to move up in the column. A buddy and I actually landed a 24 inch rainbow on a dry the other day which is an incredible rarity. A true 24 inch fish is very rare in and of itself (I mean an actual measured 24 inch fish not a guestimated 24 inch fish), and to catch that fish on a dry in incredibly uncommon. Fishing should continue to improve for at least the next month or so. Hopefully you'll find yourself in the area during that time and be able to take advantage of the quality fishing. We’ve had some excellent spring fishing out here. I personally started my spring fishing in early February this year and we’ve managed to put some really nice fish in the boat since then. I’ve been fishing both the local rivers and traveling all around our area chasing the best fishing. 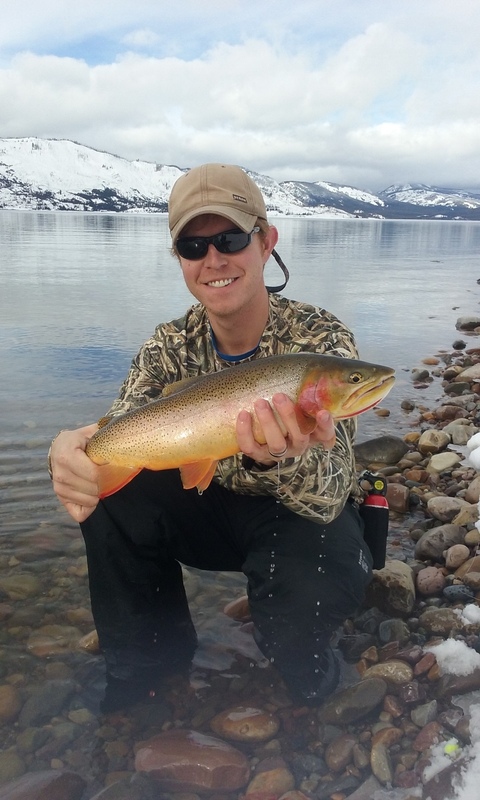 Locally the Snake, South Fork, Henry’s Fork, Green River, and many of the lakes have been fishing very well. 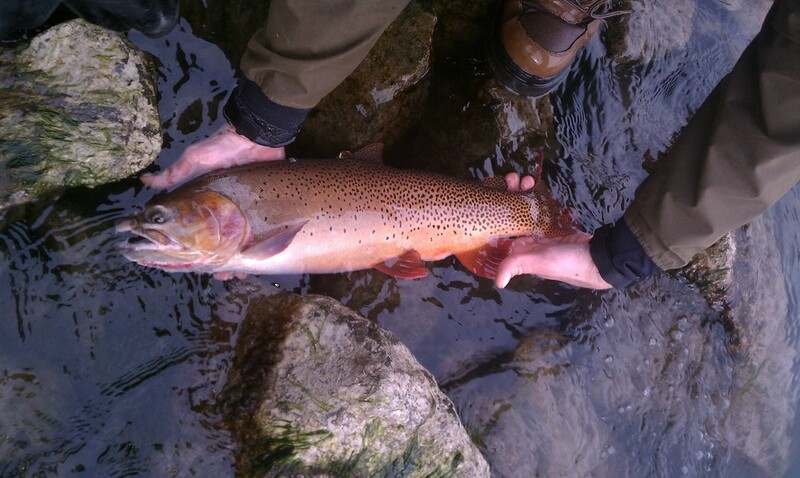 Spring started off as usual with low clear flows that required primarily nymphing and streamer fishing. In the spring, the best fishing tends to be on the best weather days. Nice warm sunny days tend to wake the fish up and get them in a feeding mood. This doesn’t mean you can’t have good fishing on cloudy day, it’s just more pleasant for the fisherman to be in sunny warm weather than cloudy cool weather. The one plus of cloudy spring days is that you can have excellent streamer fishing at times with extra-large fish looking to eat your streamer. When fishing with us this time of year expect to be fishing primarily sub-surface. Streamer patterns and nymphs are the name of the game. The best nymphs vary but, I like to fish midges in primarily red and black, stonefly patterns in large sizes, scuds (where they’re present), prince nymphs, rainbow warriors, black and red copper john’s, and egg patterns where rainbow trout are present. For streamers I like to fish slightly smaller patterns, 2-3 inch, in white, brown, black, and extra flashy. I like streamers with lots of weight that get down quickly and get into the strike zone, true “chuck and duck” fly fishing. There’s been a recent trend in fly fishing to throw HUGE streamers, 5-8 inches, with multiple large hooks. I don’t like this for a few reasons. One is that the large hooks, especially if they’re barbed, kill and damage a lot of fish and when doing this you limit yourself to only some of the largest fish in the river and exclude all the other good sized fish you should be catching. I assure you, big fish eat far more 2-3 inch baitfish than they do 7-8 inch baitfish. An example of this is the large lake trout that is pictures with this post. This is a 15 lb fish and it ate a 4 inch long pattern, not an 8 inch long pattern. The person who is fishing a 3 inch long streamer will catch exponentially more fish than someone who is throwing an 8 inch long, triple articulated streamer. Even with our primary tactics being based around nymphing and streamer fishing, you can get into some excellent dry fly fishing in the spring. I personally just caught my first dry fly fish of the year, a beautifully colored 16 inch brown last week on a little black ant pattern. 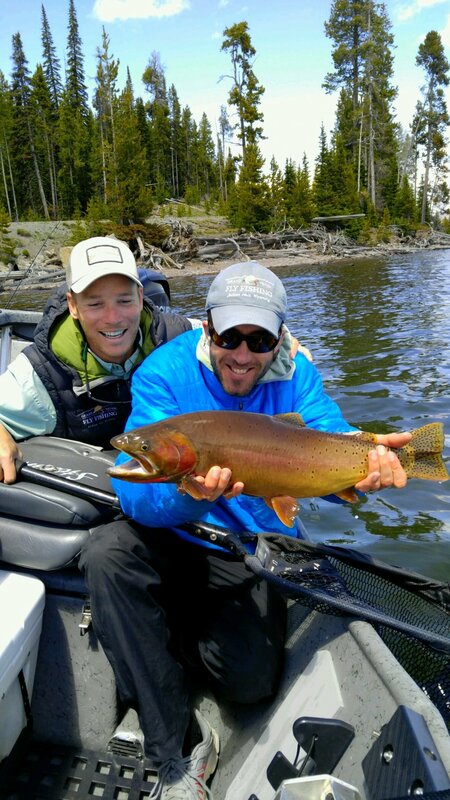 The Snake River in particular has some excellent dry fly fishing in the spring. We see great hatches of midges, blue winged olives, and skawalas which are a small (size 12-14) brown or olive stonefly. I like to fish parachute patterns, small spinner and emerger patterns, small Chernobyl ants in a variety of colors, black ant patterns, and small parachute adams. It never hurts to hang a small nymph below one of these dry flies either. At time you can find large groups of fish podded up in slower water gorging themselves on these first good hatches of the year. If you find yourself in this sort of situation you’re going to have a day that you’ll remember for quite some time. The fishing should continue to be good until full runoff hits our area and muddies up the local rivers. This will happen sometime in May when we start to get warmer weather and a large amount of snowmelt. When this happens it will cause some of the rivers in our area to be unfishable but, as always, some rivers will continue to stay clear (particularly the South Fork and the Snake River tailwaters) and some of the lakes will still fish very well. Give me a call if you’re looking to get out and try to get yourself into some of the quality spring fishing that our area has to offer. My contact info is as follows: phone #419-349-1049, email nbc4784@gmail.com, website www.jhtrout.com, and follow me for updates and fish pictures at username neil.chamberlin on Instagram. Good luck out there! Its a new year here in Jackson. We've been getting a ton of snow recently so the skiing and snowmobiling have been excellent. We had been having some decently warm weather but as I write this the thermometer is reading -18 degrees. As far as the summer goes its looking busy already. Its hard to say what will happen with the water levels at this point but I've had a ton of people calling to book so if you have a specific date you're interested in please let me know as soon as possible. A number of clients had been unsure of whether I was going to be guiding this summer or if I was going to be nursing? I can say that I will be guiding this summer and plan to start working as a nurse in the fall. I hadn't posted a fishing report all summer so I'll summarize the fall here. If you've been following me on instagram, neil.chamberlin is the name tag, you probably saw some of the pictures and got some brief reports. This fall was one of the best falls I've ever seen. I was fortunate enough to find a lot of big beautiful fish. The water levels were perfect and we were blessed with an extremely warm fall right up until thanksgiving. We were catching nice cutties in the Snake River on dry flies all the way through November. Hopefully this warm fall will have extended the growing season and reward us with some larger than average fish this summer! Runoff is starting to get rolling in our area. The Snake is clear and fishable at the moment but the water conditions are starting to vary day to day. Some days are great this time of year and other can be tough, it all varies based on weather and water conditions. If you can fish a variety of different techniques, streamers, nymphs, and dries, you can catch good numbers of fish but much of the fishing has to be deep and relatively slow on the Snake. As runoff begins in the valley we will start to rive farther to our fishing locations and fish a variety of water. This time of year we'll start heading over to the South Fork of the Snake, the Firehole River, Lewis Lake, Yellowstone Lake, and the Green River. There's always some good fishing to be had but you need to be willing to do some driving to get to it. The upper section of the Snake below Jackson Lake Dam is another location that we're lucky to be able to guide early in the season. This stretch will usually stay clear throughout the early season and offer a good fishing option. A buddy and I were fishing that section yesterday and had some great streamer fishing with lots of nice lake trout and cutty's being caught. That particular stretch is a great spot to catch a lake trout on the fly if anyone is interested in checking a laker off their list. Visit www.jhtrout.blogspot.com for the most up to date fishing reports. You can also follow me on instagram, username @neil.chamberlin or use #jhtrout.